Utilities are increasingly showing an interest in purchasing solar and other renewable energy. Many utilities are now required by regulators to allocate a portion of their energy generation specifically to various forms of renewable energy. GEI offers renewable energy solutions to utilities and specializes in solar energy deployment. GEI provides turnkey renewable energy solutions designed to help utilities meet their renewable energy goals and/or mandates. 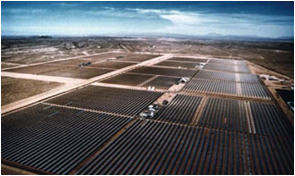 The company develops renewable generation facilities at carefully selected sites. GEI oversees every phase of the development of these facilities - including site selection, project development and design, project financing, construction, installation, and ongoing maintenance. GEI is able to make renewable energy technically and financially viable for utilities since the company builds, owns, operates, and maintains the renewable generation asset it develops. Instead of the large initial capital outlays associated with the equipment purchases required to meet rapidly increasing renewable standards, utilities only pay for the renewable energy contracted. GEI is able to provide long term pricing predictability for the contracted energy since no fuel costs are associated with renewable generation. GEI offers long term, fixed price power purchase agreements. GEI delivers clean, safe, renewable power to utility grids, helping utilities meet the increasing renewable standards and regulatory requirements around the world.